Mosquito-borne diseases are spreading at an alarming rate. Globally millions of deaths occur due to the diseases transmitted by mosquitoes, next to AIDS and tuberculosis. Several methods have been used to control these vectors and the diseases caused by them. Earlier studies have shown the potential role of mosquito gut inhabitants on disease transmission. Their findings can be used as an innovative approach for devising strategies to modify the survival of mosquitoes by reducing their lifespan, reproduction and disease transmission abilities. 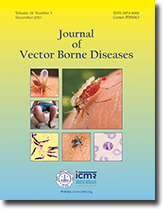 In this study, microbiome of the three genera of mosquitoes, namely Aedes, Anopheles, and Culex along with their vectorial capacity have been reviewed for assessing their role in mosquito control and transmission. Relevant articles were accessed using different databases, including LILACS, Embase, Science Direct and PubMed from inception to June 2017. The search keywords included “Aedes”, “Anopheles”, “Culex”, “gut inhabitants”, “vectors”, and “mosquito”. The titles, abstract, and keywords of the retrieved articles were screened, and eligible research articles were sorted. 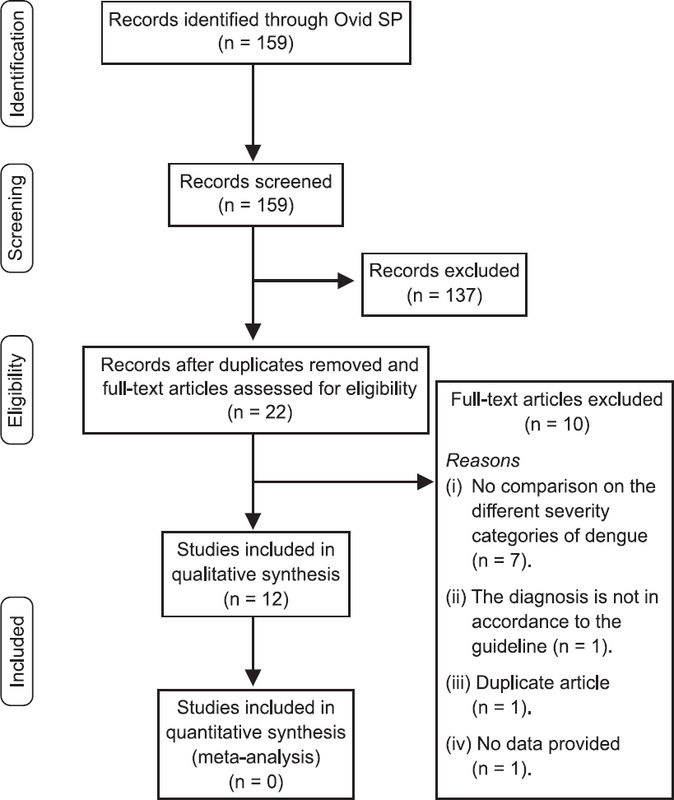 The review indicates that paratransgenesis may be considered as a versatile and effective strategy to eradicate the spurt of mosquito transmitting diseases. 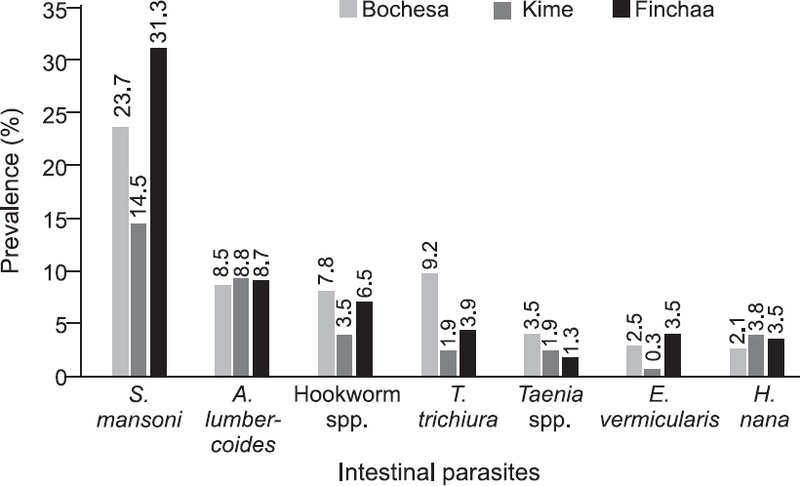 Enterobacter species is the most common type of gram-negative bacteria associated with the gut of all the three genera of mosquitoes. It was found to have a beneficial effect on humans as it helps in destroying dreadful disease-transmitting vectors. These symbiotic qualities of the microbes need to be thoroughly investigated further to reveal their antipathogenic effect on the vector. Background & objectives: Attractin, is a large multi-domain protein which has regulatory functions in multiple physiological processes and thus have strong therapeutic potential. In invertebrates, it was first identified as a water-borne protein pheromone that plays important role in chemical communication and coordinates reproductive activities. But its role in mosquitoes/insects remains unknown. Our unexpected discovery of attractin homolog from the olfactory tissue of Anopheles culicifacies mosquito prompted us to investigate the possible role of Ac-attractin (Ac-atrn) in diverse behavioural responses, e.g. feeding, mating and other non-genetic stresses. Methods: A homology search analysis was performed to identify the full length attractin (Ac-atrn) gene of Anopheles culicifacies mosquito. To unravel its molecular function during external and internal stresses, extensive real-time PCR was performed in the neuro-olfactory tissues of the adult mosquitoes as well as in the larval stages. Further, a behavioural assay was conducted to elucidate its role in mosquitoes mating behaviour. 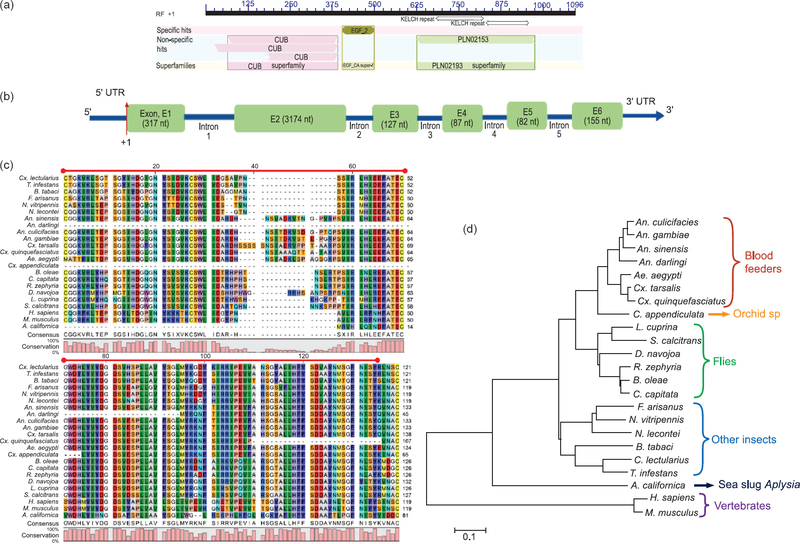 Results: The results indicated that Ac-atrn is a 3942 bp long transcript which encodes a 1313 amino acid protein, having multiple domains including CUB, EGF, Keltch, etc, with 80–90% homology to other insect/mosquito homologs. 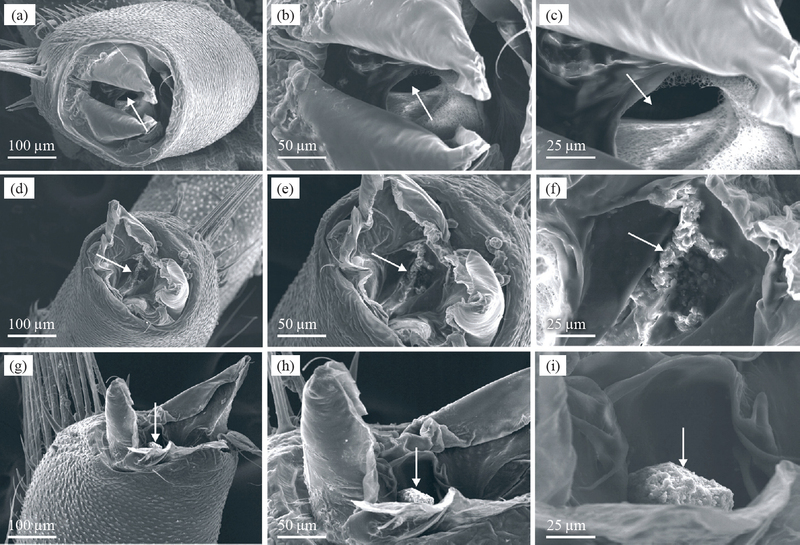 Ac-atrn gene was dominantly expressed in the young larvae and its expression was elevated in response to the fresh food supply in the starved larvae. Cold stress temporarily arrested the expression of Ac-atrn gene. In case of adult mosquitoes, olfactory and brain tissue showed relatively higher expression of Ac-atrn than reproductive organs. Although, starvation did not yield significant changes in olfactory tissues, but aging and nutritional stress modulated Ac-atrn expression in the brain tissue. Furthermore, a circadian rhythm dependent change in the expression of Ac-atrn of virgin and mated mosquitoes (both sexes), indicates that Ac-atrn might also have a pheromone guided role during swarm formation and mating behaviour. Interpretation & conclusion: The relative expression profiling of Ac-atrn gene in the larvae during nutritional and cold stress suggested its possible role in mediating chemical communication towards the food source and in thermal regulation of young larvae. Similarly, it might have crucial regulatory role in the stress management and survival of adult mosquitoes. The results revealed that Ac-atrn gene is a global regulator of many physiological processes in mosquitoes including stress response and mating behaviour and thus might be a potential target to design novel intervention strategy against mosquitoes. Background & objectives: Salivary gland proteins play a pivotal role in blood feeding, epithelial interactions, and parasite transmission in mosquito vectors. Anopheles culicifacies is a complex of five sibling species, viz. A, B, C, D, and E, with diverse geographical distribution patterns. Among these, sibling species B has been identified as poor vector. Exploring the differentially expressed salivary proteins in An. culicifacies may potentially identify refractoriness factors during malaria parasite maturation and may help to elucidate the mechanism of refractoriness. 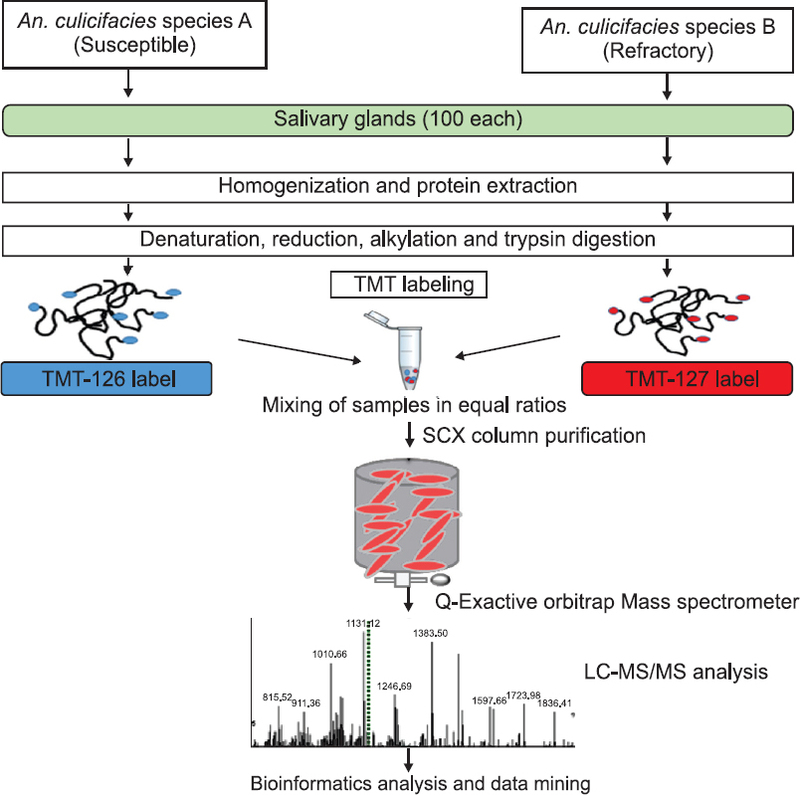 Methods: A comparative proteomic analysis was carried out using tandem mass tag (TMT) technology combined with LC-MS/MS mass spectrometry and bioinformatics analysis, to identify the differentially expressed salivary gland proteins among An. culicifacies species A (susceptible) and An. culicifacies species B (refractory) mosquitoes. Results: A total of 82 proteins were found to be differentially expressed. 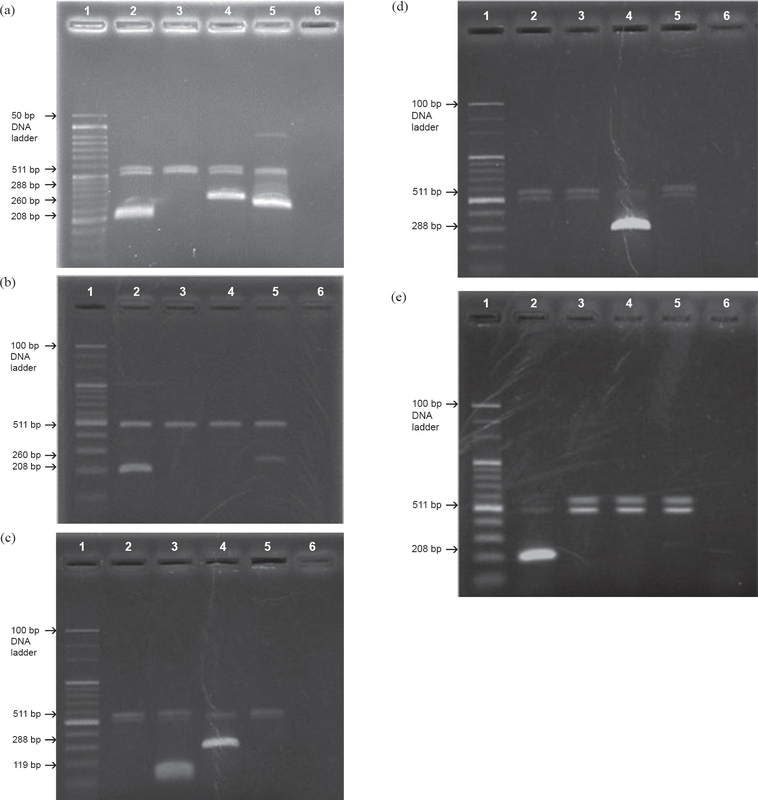 Out of these, seven proteins including TRIO, translation initiation factor 5C, glutathione S-transferase, and 5’ nucleotidase were up-regulated, and 75 proteins including calreticulin, elongation factors, fructose biphosphatase, isocitrate dehydrogenase, histone proteins and anti-platelet proteins, etc. were down-regulated in refractory species. Analysis of KEGG pathways showed that the up-regulated proteins were related to fatty acid metabolism and RNA transport pathways. Interpretation & conclusion: This comparative proteomic analysis of susceptible and refractory An. culicifacies salivary gland proteins identifies the plausible role of the differential proteome in immune responses, digestion, energy, and carbon metabolic pathways. This information may serve as a basis for future work concerning the possible role of these proteins in refractoriness dependent metabolic function of mosquitoes. Background & objectives: Leishmaniasis is one of the major neglected zoonotic parasitic diseases whose treatment and control is very complex. Pentavalent antimonials remain the primary drugs against different forms of leishmaniasis, however, resistance to antimony and its toxic effects has necessitated the development of alternative medications such as use of medicinal plants and natural compounds. The aim of the current study was to assess the in vitro and in vivo activities of chitosan as a natural resource against Leishmania major. 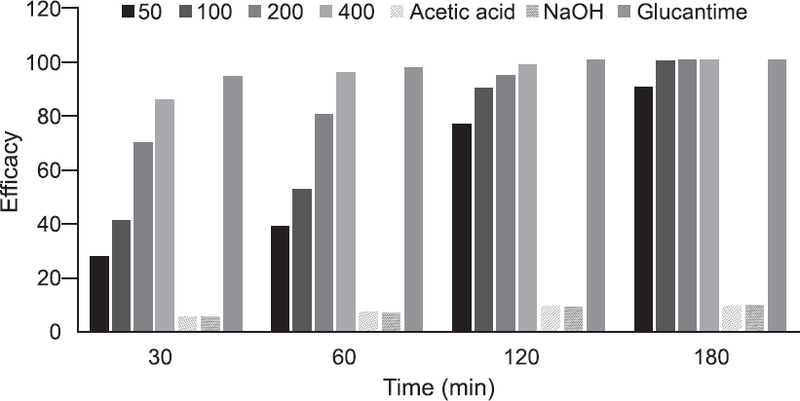 Methods: Low molecular weight chitosan, with 95% degree of deacetylation was melted in normal saline to a final concentration of 50, 100, 200 and 400 μg/ml. Then, the promastigotes of L. major (Iranian strain) were added to the wells of 96-well plate and 20 μl of each concentration was added to the RPMI 1640 medium. Live and dead promastigotes were counted after adding 0.1% eosin stain. The efficacy of the chitosan was also examined in BALB/c mice infected with Iranian strain of L. major. All in vitro experiments were performed in triplicate and the results of in vitro and in vivo tests were compared to the acetic acid and NaOH as negative control and glucantime as positive control. Results: The low molecular weight chitosan was completely effective at concentrations of 100, 200 and 400 μg/ml on promastigotes of L. major after 180 min of application. Moreover, in the in vivo study, the mean size of dermal lesions significantly decreased in the groups treated with the chitosan compared to the control group. Interpretation & conclusion: According to the results of the study, it can be concluded that chitosan is a potent active compound against L. major and could be evaluated as a new antileishmanial drug in the future. Background & objectives: There is an urgent need of introducing new insecticide molecules with novel modes of action to counter the ever growing insecticide-resistance in mosquito vectors. In the present study, a new insecticide molecule, SumiShield 50 WG (clothianidin 50%, w/w) was investigated for its efficacy as an indoor residual spray along with its residual action in comparison to deltamethrin, pirimiphos-methyl and bendiocarb. Methods: The study area included three villages in Almatti Dam catchment area in Bagalkot district, Karnataka, India. Spraying was done using Hudson sprayers with the following dosages—Clothianidin, 300 mg AI/m2; deltamethrin, 25 mg AI/m2; bendiocarb, 400 mg AI/m2; and pirimiphos-methyl, 1 g AI/m2. Cone bioassays were conducted on cement and mud plastered surfaces at fortnightly intervals to assess the bioefficacy and residual activity. Mosquito densities in the sprayed houses were recorded at regular intervals for assessment of the insecticidal efficacy. Filter paper samples collected from the sprayed houses were analyzed for insecticide content sprayed on different wall surfaces at the Walloon Agricultural Research Institute, Gembloux, Belgium. Results: Chemical content analysis of filter paper samples revealed that the applied to target ratios were in the acceptable range (1 + 0.5) for all the treatment types. Duration of persistence of effectiveness of bendiocarb (≥80% mortality in cone bioassays) was 19 to 21 wk on cement plastered surfaces and 15 to 19 wk on mud plastered surfaces. Duration of persistence of effectiveness of deltamethrin was 17 to 21 wk on both mud and cement plastered surfaces and that of pirimiphos-methyl was 15 to 19 wk. For SumiShield, it was 17 to 25 wk on both types of surfaces, indicating slow action of SumiShield. The densities of Anopheles culicifacies were lower in bendiocarb sprayed houses throughout the observation period, followed by pirimiphos methyl, deltamethrin and clothianidin sprayed houses. In case of other mosquitoes also, similar trend was observed. Interpretation & conclusion: Considering the persistence of effectiveness of SumiShield on sprayed surfaces, effectiveness in reducing the density of mosquitoes, operational feasibility, safety and community acceptance, the formulation of clothianidin is a better option for IRS for the control of insecticide-resistant mosquito vectors. Background & objectives: In India, certain geographic regions witness simultaneous outbreaks of two or more diseases like scrub typhus, dengue fever, malaria, leptospirosis and chikungunya during monsoon and post-monsoon period, sharing common indication of acute febrile illness. 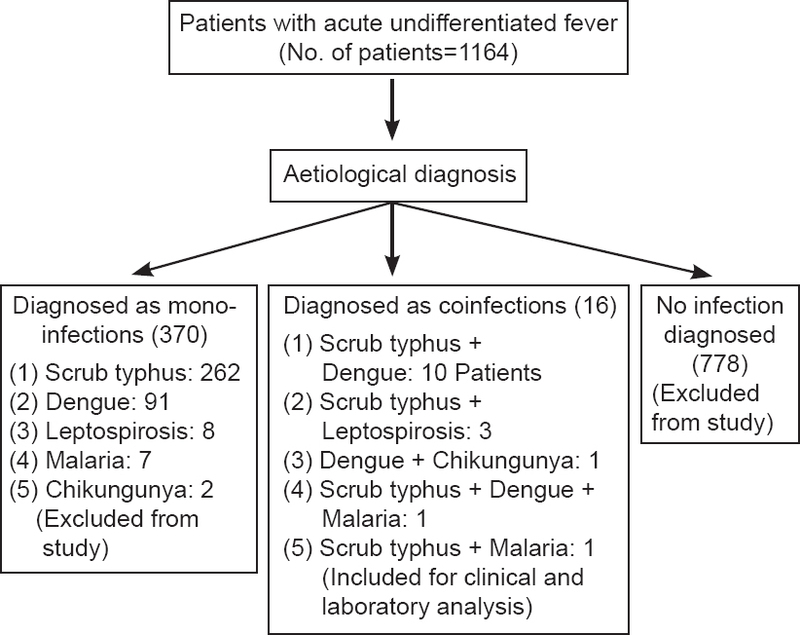 The objective of the present study was to assess the prevalence of coinfections among patients with acute undifferentiated fevers (AUF) admitted in a tertiary care hospital in the northern hilly state of Himachal Pradesh, India. Methods: This was a hospital based open cohort study conducted over a period of two months (September and October) in 2016. All the patients above the age of 18 yr admitted in medical wards and fulfilling the definition of AUF were included. The patients diagnosed with dual infections were the subjects of the study. Standard guidelines were used for case definitions of scrub typhus, dengue, chikungunya, malaria and leptospirosis. Results: Dual infections were noted in 16 patients admitted with AUF. The most common coinfection was scrub typhus and dengue, reported in 10 patients. Scrub typhus and leptospirosis coinfection was observed in three patients. Dengue and chikungunya was observed in one patient. Scrub typhus, dengue and vivax malaria was detected in one patient. Scrub typhus and vivax malaria was detected in one patient. Out of the 10 cases positive for both scrub and dengue, four had no history of travel outside Himachal Pradesh. All three cases positive for both scrub and leptospirosis were indigenous without any history of travel outside Kangra, Himachal Pradesh. The outcome of all the patients was with full recovery. Interpretation & conclusion: The study established the presence of coinfections (mainly dengue fever and leptospirosis) as a cause of AUF in the study area, which is a nonendemic region. 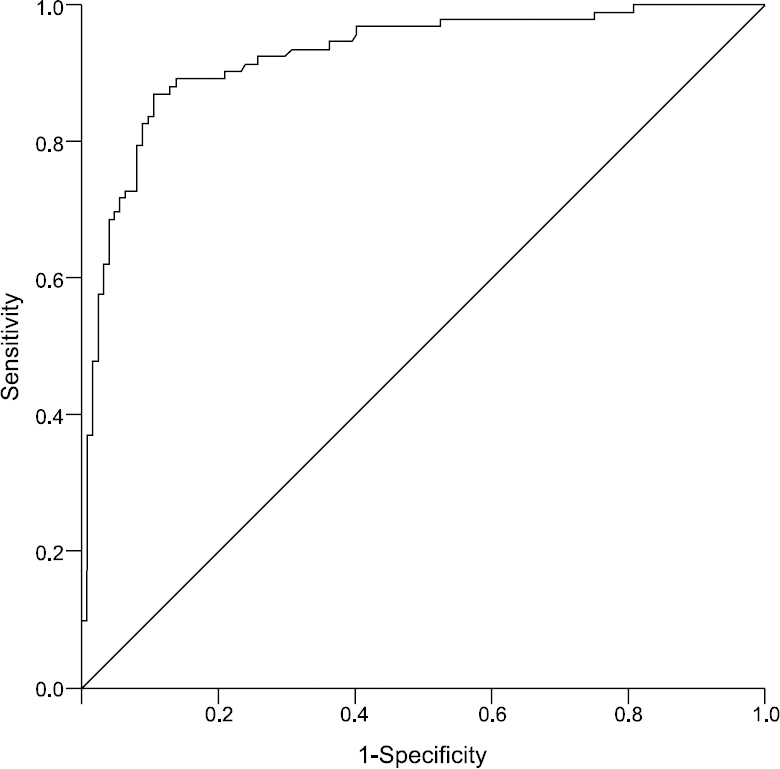 The role of easily available and widely performed serological tests in the aetiological diagnosis of AUF is significant. Studies are required to determine the normal titres in the local population before using the imported commercially available serological tests in the diagnosis of AUF. 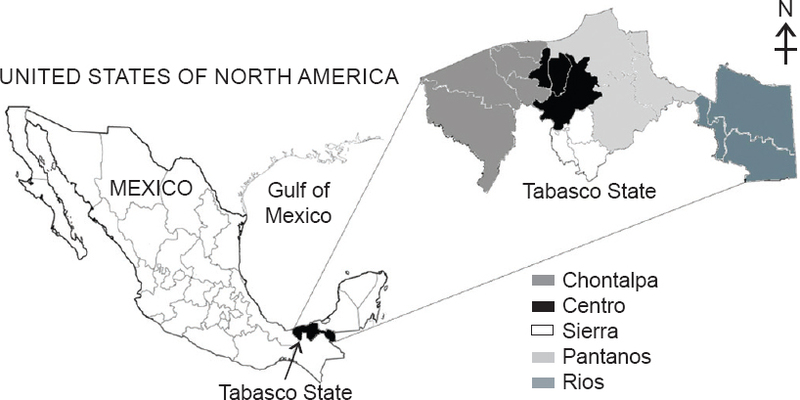 Background & objectives: The first chikungunya (CHIK) epidemic in the Americas was reported in December 2013. Chikungunya virus (CHIKV) causes an acute febrile illness and is transmitted to humans by Aedes mosquitoes. Although earlier studies have described long-term clinical manifestations of CHIK patients infected with the East/Central/South African (ECSA) genotype, little is known about persistent manifestations in the Caribbean region, for which the Asian genotype is responsible. The objective of this study was to describe the presence of persisting clinical manifestations, specifically arthralgia, in CHIKV-infected patients on the Caribbean Island, Sint Maarten, 15 months after onset of the disease. Methods: This retrospective cohort study included confirmed CHIK patients that were recorded by the participating general practitioners (GPs) during the chikungunya outbreak in 2014 in Sint Maarten. Between March and July 2015, 15 months after the onset of disease, patients were interviewed via telephone about the presence, duration and impact of clinical CHIKV manifestations. Results: In total, 56 patients were interviewed (median age 47 yr), of which 30 (54%) were females. Out of the total interviewed patients, 52 (93%) reported arthralgia for the first three months after the disease onset, of which 23 (44%) patients reported to have persistent arthralgia, 15 months after the disease onset. Pain intensity of persistent arthralgia was perceived as mild in the majority of patients (n = 14; 60%), moderate in 7 (30%) patients and severe in 2 (9%) patients. During the acute phase of disease, most patients had to miss school or work (n = 39; 72%) due to clinical CHIKV manifestations and reported a negative impact on daily activities (n = 36; 57%). Interpretation & conclusion: Results suggested that persisting arthralgia is a frequent complication in CHIK patients included in the study. Future research on strain-specific clinical long-term manifestations and on their impact on daily life of patients, in the form of a comparative study between patients and controls, is recommended.